Although it isn’t exactly new, it’s only recently that it’s being adopted by more and more industries. If you haven’t come across or heard of laser measures before you’re probably wondering how they work. In basic terms they shine a laser onto a target which pushes out an ultrasonic frequency. This frequency bounces back off the target and then the tool calculates how long it takes for the frequency to return to the device. From this it measures the distance. Most laser measures though offer more functionality than this. Another common use is to calculate the volume of an area. The quality of the equipment, of course, is dependent on its cost. Higher quality can usually travel a further distance where as lower cost measures should be primarily used on smaller jobs. 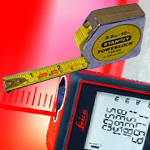 Who can use a laser measure? Obviously, laser measures aren’t ideal for outdoor use. But some major manufacturers have produced measures that can be used outdoors. They can be used in nearly any industry that requires distance measurements. They generally provide an accuracy of around 99%, which is ideal for most applications. Electricians – Laser measures are perfect for gathering information on cable lengths, alarm system heights and other measurements to ensure that they’re meeting with the rules and regulations of their industry. Building surveyors – Using the accurate measurements from a laser measure building surveyors can advise on how best to work on a property. Estate agents could also use the equipment to inform potential buyers of distance between rooms etc. Media – I bet you didn’t guess that this industry would pop up, but think about it. Camera operators and photographers can measure the distance between their equipment and subject so that they can create an optimum set up. So, whilst the tape measure does still have a place in DIY toolboxes, professionals should start to consider laser measures. Their varying functions and straightforward accuracy, means that they’re perfect for professional use. This entry was posted on Tuesday, October 8th, 2013 at 10:44 am	and is filed under Leica DISTO, Leica DISTO D2, Leica Disto D210, Leica Disto D3a, Leica DISTO D3a BT, Leica DISTO D5, Leica DISTO D510, Leica Disto D8 laser measure, Leica DISTO DXT, Leica DISTO X310, Leica Racer 70. You can follow any responses to this entry through the RSS 2.0 feed. You can leave a response, or trackback from your own site.